Each time I pass by the old relic sign of the Keller Hotel, I almost have to convince myself it's the real thing. That anything so ephemeral could survive on the radically transformed West Village waterfront seems incredible. Where the once-bustling dockfronts degenerated into a post-industrial fantasy of seedy bars and abandoned piers backdropped by the rusting hulk of the West Side Highway, there are now luxury apartments girdled by the lush plantings of the Hudson River Park. The change has been seismic, but this fragile relic remains. For me, the Keller's old sign is perhaps the single most evocative remnant of the waterfront's past life. Its painted sheet metal has taken on an especially vivid patina, with faded hues of brown and beige that complement the old brick hotel from which it hangs. 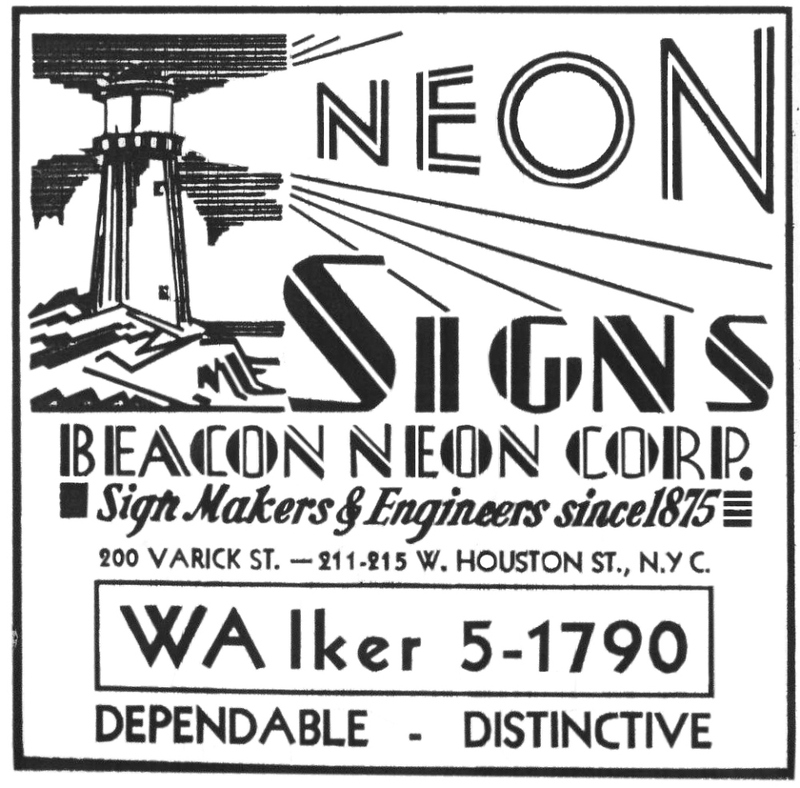 Records at the Buildings Department indicate that the sign appeared here in 1933, the work of the Beacon Neon Sign Co of West Houston Street. Its streamlined silhouette looks like an upside-down thermometer. An angled neon arrow, gone now, once hung beneath it, pointing toward the hotel's entrance. 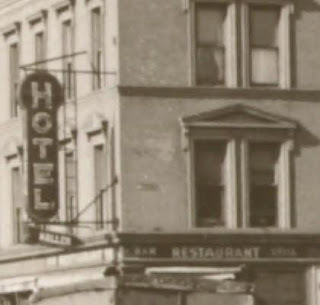 The building itself predates the sign, having begun life as the Hotel Knickerbocker in 1898. 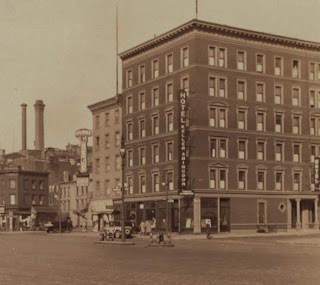 When it opened, the Knickerbocker must have stood out as one of the more reputable hotels on this perennially gritty waterfront. A modern, six-story building designed by the noted architect Julius Munkwitz, it contrasted sharply with the smaller, dingy flops that stood beside it. Even in its heyday, the New York waterfront was a place most respectable people avoided except to board ferries or steamships. This left a wide berth for bars, brothels and bawdy houses that catered to sailors and dock laborers, mostly single men. 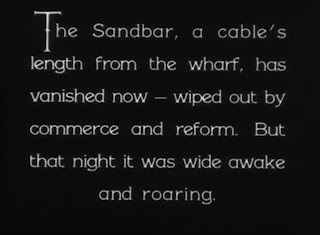 One gets a sense for the scene in the 1928 film "The Docks of New York" (viewable in its entirety at YouTube). Set in the 1890s, the film partly takes place at a seedy saloon called the "Sand Bar", which had since been "wiped out by commerce and reform." 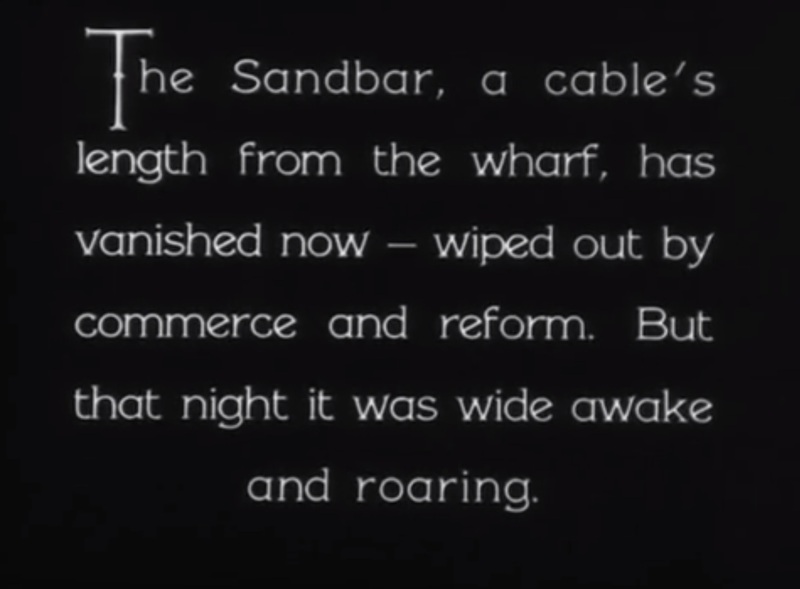 Intertitle from the 1928 film "The Docks of New York". The Sand Bar may have yielded to commerce and reform, but the waterfront generally resisted most attempts to clean it up. As port traffic declined in the middle decades of the twentieth century, the once respectable Keller soon came to blend with the infamously disreputable hotels around it, eventually providing SRO housing for very low income persons. With the piers increasingly disused after World War II, the waterfront became even better suited as a refuge for various subcultures, particularly the city's emerging gay community. The Keller's ground floor saloon is said to have become a gay bar as early as the late 1950s, anticipating many others that opened nearby in the ensuing decades. In an age when homosexuality was considered about as far as one could get from mainstream mores, the Keller's old neon sign marked a portal into a world of "gross indecency". The sign was still there in the '70s, by which time Keller's (as the bar became known) figured among a growing number of gay bars that clustered along the old waterfront. Though more aboveboard than in previous decades, these establishments were typically somewhat less polished than the sashay-away gay bars of recent times. A 1971 guidebook called "The Gay Insider: A Hunter's Guide to New York and a Thesaurus of Phallic Lore" described Keller's as "the oldest gay leather bar in town." The internet provides a few spirited accounts of Keller's in the libertine years between Stonewall and the AIDS crisis (links below). "When it was not so fashionable to be an out-of-the-closet homo-thug," recounts one, "Keller's was a place where men from the projects and their admirers could hang out on the 'down-low'." Keller's is empty now, "commerce and reform" having finally triumphed over the wayward ways of the waterfront. The hotel shuttered around 1990, according to a 2006 story in the New York Times. Work began on a (presumably luxury) residential conversion in 2004, but stalled soon after, leaving the hotel's old sign to linger on over the foot of Barrow Street. The place is now protected by the city's Landmarks Commission, which will hopefully help ensure that something good happens here, sign-wise at least. • The Landmarks Commission's incredibly thorough designation report on the Keller Hotel. • NYT coverage of the Keller's recent suspended animation make-over: two stories, one from '06 and one from '08. "The ghosts of the past breathe deeply here." • Reminescences of fast times at Keller's, here, here, here, here, and here. • Check out the new book Signs, Streets and Storefronts: A History of Architecture and Graphics Along America's Commercial Corridors, by Martin Treu. 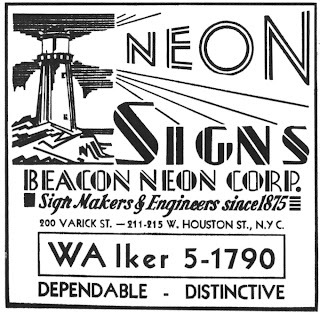 • Via Project Neon - help save a landmark Roanoke, VA sign. Loved Kellers Bar. Another era.